Definition at line 191 of file cmocka.c. Definition at line 192 of file cmocka.c. Definition at line 194 of file cmocka.c. 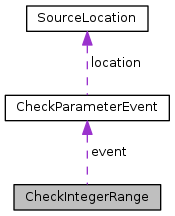 Referenced by check_in_range(), check_not_in_range(), and expect_range(). Definition at line 193 of file cmocka.c.